Unite is balloting its members for fresh strike action in a longstanding dispute with Mears in Manchester. 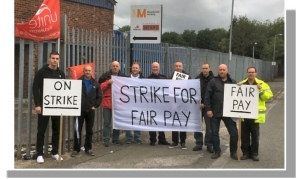 Unite members employed in housing maintenance roles at Mears and at Manchester Working (a joint venture operated by Mears) have already taken 40 days of industrial action this summer in a dispute over pay differentials (up to £3,500 for workers doing the same role) and attacks on terms and conditions. The new ballot is as a result of Mears failure to: meaningfully negotiate on pays and conditions, the detrimental treatment of workers during the previous dispute, attacks on workers’ holiday entitlement, allocation of work to sub-contractors, inappropriate allocation of work to apprentices, trainees and improvers and proposed unilateral changes to working hours and conditions for some of the affected workers. The ballot for strike action will open tomorrow (Wednesday 4 October) and close on Wednesday 18 October. If members vote in favour of strike action, then these are likely to begin during November and the dispute will run during a period when bad weather increases the requirement for urgent repairs. The workers undertake housing maintenance work on 12,000 properties managed by Northwards Housing Association in north Manchester. The contract was tendered by Manchester council. Unite regional co-ordinating officer Any Fisher said: “Unite members at Mears and Manchester Working are entirely dedicated to resolving their longstanding grievances with their employers. “Unite has given Mears every opportunity to resolve this dispute and Mears has entirely failed to do so. As a result Unite has no option but to ask our members to once again take strike action. “If strike action occurs then urgent repairs will not be undertaken and planned maintenance will be delayed. This will seriously affect tenants but Mears has demonstrated it has no interest in their welfare.